Hi everyone! My name is Melanie Langston-Bazzell, and I am a regular volunteer at Farm Animal Refuge . My days volunteering at the farm are invaluable moments of magic! Some days I like cuddling with Willie the potbellied pig. 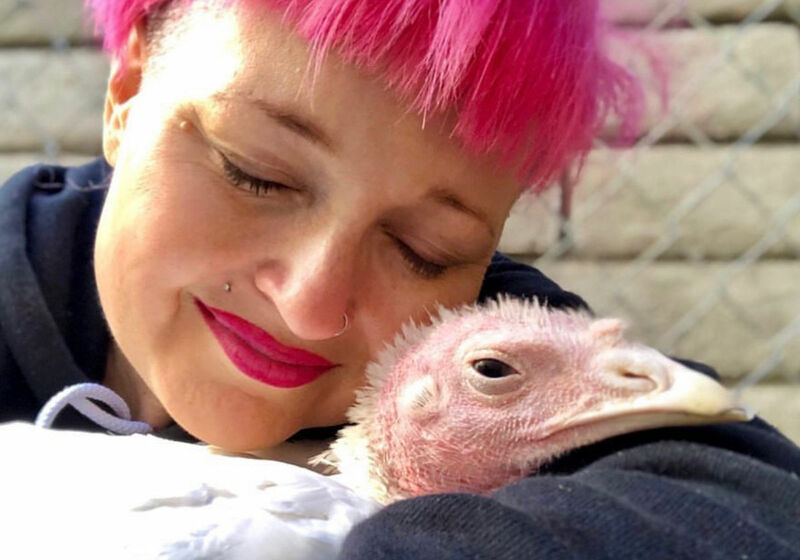 Other days I cuddle with baby turkeys, who come from less fortunate circumstances, but have learned to love and forgive. In fact, I feel a connection to each rescued animal, in ways others might not understand. I myself was rescued. I too once had no voice, and even though it is difficult for me to imagine the terrible torture that many of these animals have endured, I can relate to what it feels like to be voiceless, helpless, and afraid. You see, animals share the same emotions as human beings. Please allow me to share my journey with you. Due to my own suffering, the veil over my eyes was lifted and I saw the most gentle, loving, creatures on this planet being terrorized. When I was 12 , a PETA volunteer reached out and offered me literature. It shaped the rest of my life. I was a pre-teen mall rat, and my eyes were opened to atrocious that shocked and saddened my soul. I knew I had to reconsider my choices. Wielding my own literature, with homemade, hand sewn farm animals (used for visual demonstrations) , I begin approaching anyone who would listen. I feel this is important to mention, as one conversation can change the direction of someone’s life, as it changed mine. Fast forward roughly two decades….In 2011, I sustained a life-threatening traumatic brain injury and spinal cord injury. I was suffering and others were making poor choices for me. I could not advocate for myself, as my ability to communicate was diminished. I re-learned how to walk, talk, write, read….become a human being. With a blank brain, I knew I had to re-build my mind carefully, and use my new chance at life to help others. I began using my newly found art skills to create animal portraits for sanctuaries to auction off for donation. It was my way of giving back. This brought me great joy as I was living as a hermit due to my serious sensory processing injuries. I also began rescuing and rehabilitating chickens. I was unable to interact with humans, however I found a profound connection with chickens Our backyard became my new home. I was a feral person connecting with nature in ways others can’t imagine. I literally became a member of the flock and felt a kin to Jane Goodall in the forest observing apes. Without any mind clutter or speech I was able to connect with my flock, on a different plane. Chickens became my reason for living. I lived outdoors. They are the reason I survived years of surgeries and anguish. Chickens are just like us, they have nervous systems. They feel pain, joy, happiness, fear and love. They each have individual personalities. I fell in love with these beautiful, sentiment beings, and they fell in love with me too. I was unable to listen to any audio or open my eyes to view the world. Both caused extreme pain, confusion, loss of cognition, diminishes speech and motor skills. The sensory pain was agonizing. My brain would physically shut down, in order to protect my healing brain. I required a person with me at all times, for 6 years, because this happened frequently. I began volunteering at protests, long before I was aware of my own surroundings. I wore a chicken mask to an animal advocacy protest, out of sheer necessity. My husband held my hand and guided me through the crowds. No one ever guessed that there was a scrambled/damaged human being inside who could barely communicate or visually/auditory process information. The mask, sunglasses and and hidden headphones helped me integrate back into society without endangering my senses. I was unable to speak properly and my motor skills were highly impaired but I could sure hold a sign and get my point across. Did I mention I spent many of these years without mobility, in a wheelchair? Thankfully, I risked a dangerous spinal cord surgery, and regained the ability to use my legs. I still have many deficits and disabilities. Through years of hard work and discipline, I have learned to manage them in ways that allow me to advocate, educate, in new and creative ways. I don’t remember/recognize the person I was prior to my accident. That Melanie disappeared. I took the opportunity to build myself into an individual of higher character, more education, less judgment, more love. The new Melanie will always speak out on behalf of those who are oppressed, marginalized, victimized. My life is not of neutrality, but a life of action, compassion and awareness. I have found ways to disguise my deficits and work with my abilities. I volunteer as a full-time animal activist. I now volunteer as co-organizer for our San Diego Anonymous for the Voiceless chapter. I also co-organizer (co-founder) for San Diego Animal Save. I am also a volunteer journalist/reporter for Jane Velez Mitchell, JaneUnChained. When I’m not volunteering, I rescue and rehabilitate chickens in my own backyard micro sanctuary, Om Tweet Om. I am extremely knowledgeable regarding chicken care , and I use every opportunity to teach others. Chickens are gentle, loving, curious, and depend on us for care and advocacy. Eight years later, many surgeries and years of rehabilitation, I am now able to attend conferences, coordinate community activities and live my dream of advocating/speaking up for all animals. Animals saved my life. I owe it to them to return the favor. Melanie is a co-organizer for the save movement and anonymous for the voiceless in San Diego. She is also a volunteer at Farm Animal Refuge and a reporter for Jane Mitchell. She participates in various other activism including protests, Direct Action Everywhere, and helped organize the Animal Rights March here in San Diego.